Can Dental Cavities Cause Tooth Loss? By practicing good oral hygiene habits and maintaining a regular schedule of dental exams and cleanings, most people can avoid serious dental complications. However, even with proper care, it is not unusual for dental problems to develop. One of the most common oral health problems is the development of a dental cavity. Cavities are small areas of decay; the decay damages healthy tooth enamel and leave holes in the outer layer of the teeth. Restorative dentistry treatments rebuild damaged teeth to restore a protective layer around the sensitive tissues that lie in the center of the tooth. A dental cavity can be easily repaired so that more serious complications do not develop. However, when cavities are ignored, they seriously threaten the teeth. Cavities and tooth loss can become a risk for our Albuquerque, NM patients if restorative treatment is not sought in a timely manner. Dr. Byron W. Wall is happy to offer his patients a range of restorative dentistry treatments that address decay and prevent dental cavities from leading to tooth loss. Because cavities are so common, most people don’t really give them much thought. In addition, many patients feel that a cavity can be easily treated, so they fail to give this condition the serious consideration it deserves. While a cavity can be easily repaired, it is a hole in the tooth’s outer layer of enamel. 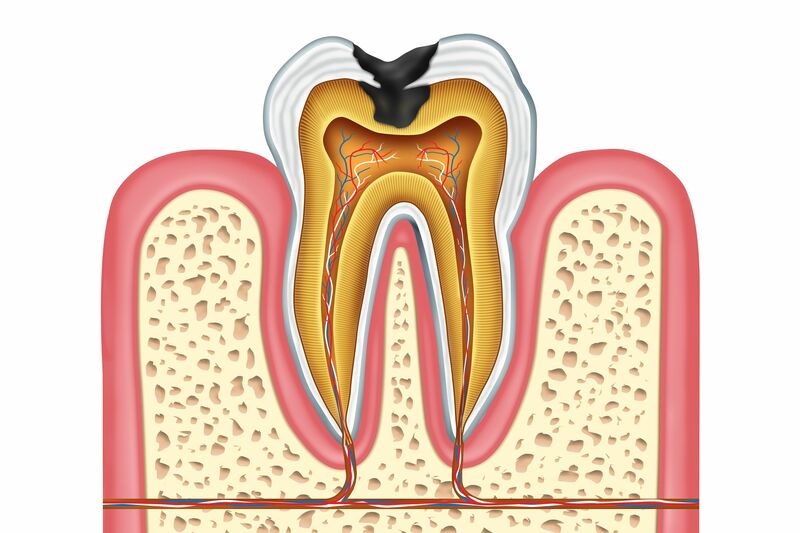 This hole can expose the nerves and roots of the tooth, increasing the risk of a root canal infection. Further, tooth decay is a progressive condition, meaning it will continue to worsen until the situation is treated. If patients delay dental treatment out of a lack of concern, the dental cavity will only get bigger. As decay progresses, the likelihood of the inner tooth becoming infected also increases. Although a root canal infection can often be treated, it is not as easy to repair as a dental cavity. And, in some cases, the damage of a root canal infection is irreversible, meaning that tooth extraction will be necessary. The bottom line is that, the longer a cavity goes untreated, the greater the risk of serious dental complications, including tooth loss. There really is no need for a dental cavity to lead to tooth loss. With prompt treatment, a dental cavity can be repaired so that the strength of the tooth is restored and the inner layer of the tooth remains protected. The most common treatment for a cavity is a dental filling. During dental filling treatment, Dr. Wall cleans the teeth to remove debris and bacteria. He then applies a tooth-colored dental compound directly to the area of the tooth that has been damaged. This compound is shaped and molded to the tooth so that it fills in any holes left by decay, while appearing to be a natural part of the tooth. When Dr. Wall is satisfied with the shape and fit of the compound, it will be dried and hardened. This process bonds the material to the tooth and provides an added degree of strength to the restoration. At Dr. Byron W. Wall’s dental practice, tooth preservation is one of our number one goals. We offer a full range of restorative dentistry treatments that address even the most serious oral health problems to allow patients to maintain their natural teeth. If you’d like to learn more about these services, and how they can help you restore a strong, healthy smile, schedule an appointment at your earliest convenience.